Happy Friday! I admit, I normally don't talk beauty much on the blog, but as I've gotten older, I'm learning that I need to make some changes with my beauty routine. I've noticed more sun spots, more tired looking skin, and I'm pretty sure my makeup could use some major updating. 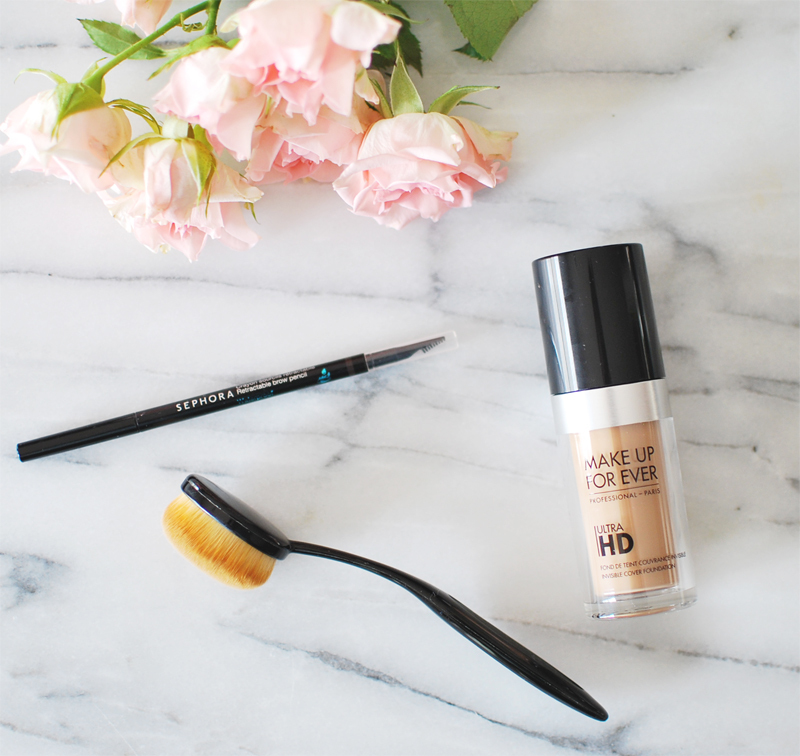 Cue in my most recent purchases to help me look a little younger and more fresh-faced. I've been growing out my eyebrows for almost a year now (why does it take so long for them to grow out??) and I'm happy to say that they're starting to look a lot fuller. Can I just say how much I regret all those years of over plucking?? Wish I could tell my younger self that fuller brows are better than no brows. Even though they're looking fuller, they still need a tiny bit more help, so I went into Sephora the other day and didn't go crazy with what to get for my brows. I'm still in the learning phase of all this beauty stuff, so I went easy and got a brow pencil by the Sephora brand. It was inexpensive as compared to other brands, easy to use, and makes my brows look almost like a professional worked on them. I realize that having bangs, I shouldn't worry too much about my brows, and I was on the same mindset for a few years. But then any time there'd be a breeze and my bangs would fly up, everyone could see what a horrible state my brows were in and that just left me feeling a bit embarrassed. So I said enough is enough and decided to grow them out. Even though it took forever, it was totally worth it because I can finally shape them a bit, and really make myself look like I have less of a frown all the time. Let me explain. So my brows naturally have a sharp arch and what my brow lady does now is soften the arch so that it doesn't look like I'm angry all the time. The transformation is quite wonderful and makes such a difference. Even Steve agrees with me and is all for taking care of my brows. I promise to have photos of me with these products on. This week was kind of a wash since Steve was out on business, which left me with no photographer. The next beauty item that I was in search of but didn't really do anything about until just a week ago is foundation. I have been a long time user of Laura Mercier's tinted moisturizer for everyday (love it and swear by it), but I needed something with a bit more coverage for those rare times that I do need to look a bit more polished and professional. I had heard good things about the Make Up For Ever Ultra HD Foundation and thought I'd give it a go. And, you guys, it does not disappoint. It's got great coverage, but it's not so cake-y that it looks like you have make up on. It disappears into your skin and creates this great even skin tone that I can only dream about. Oh, and using this beauty brush really helps to get it on my face evenly. Plus, it's just fun using it versus my fingers. I'm kind of obsessed with using the brush now. I want to use it everyday, even with my tinted moisturizer! What do you guys think about me doing beauty posts? Was this helpful at all? Or boring, unnecessary, useless? Or did you find it insightful? Let me know what you guys think! If you want to know or see more, I'll be sure to do a proper post (by that I mean with photos of me wearing the makeup) on using these products.